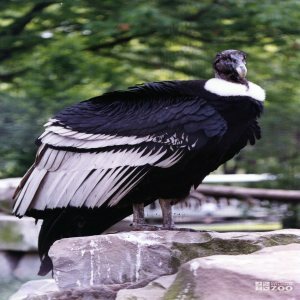 Their range of the Andean Condor is South America, mainly the Andean cordillera. The habitat of the Andean Condor is mountain peaks and shorelines. The incubation of the Andean Condor's eggs is 54 to 58 days. As with all New World vultures, the Andean Condor does not build a nest. Instead, eggs are laid on the ground in tree cavities or between rocks. During November and December two whitish-yellow eggs with brown spots are laid. Condors have a very low reproductive rate, producing at most one chick every two years. The actual nest is most often in crags, often exposed to wind and bad weather. Both male and female rear the young, which fly at 6 months and are almost adult in size and weight. When mating, the male bounces up with gaping and hissing bill-snapping. Both sexes perform wing-spreading displays. Condors reach sexual maturity at 7 to 8 years. Their diet in the wild is Carrion, especially dead sea lion pups and small animals. Their diet in the zoo is carnivore diet, rabbit, chicken, vitamins and minerals.